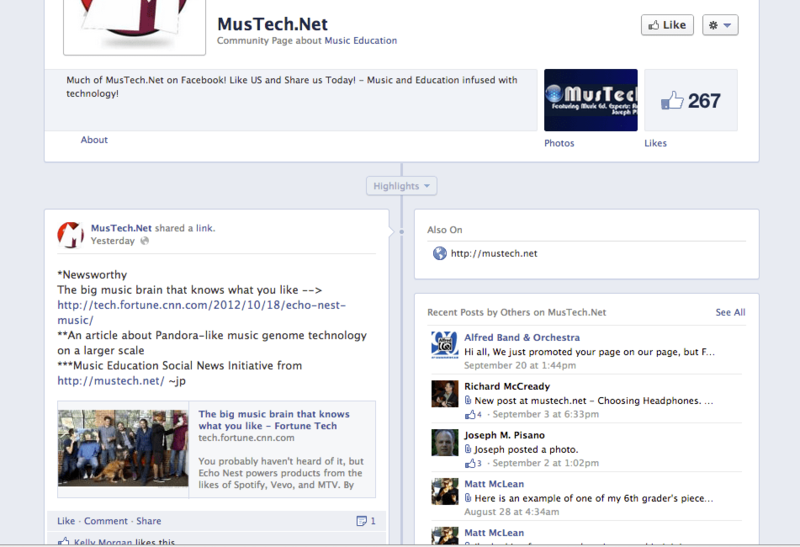 Last week MusTech.Net officially started its new Social Media Music News Initiative with two posts each day at our official Facebook page, http://facebook.com/mustech.net. What is this initiative all about? 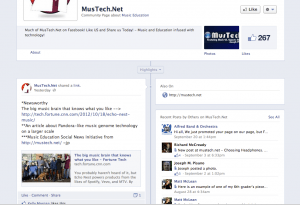 It’s an extension of the primary goal of our website, MusTechNet; to continue to promote useful, interesting, and timely information to musicians and music teachers throughout the web. This initiative is very unique because we’ve created an opportunity for undergraduate music students to take the lead with it and make decisions about the content of the daily postings that will appear on MusTech.Net’s Facebook page. The “college” perspective on what’s “newsworthy” and “interesting” constitutes will be a nice compliment to the content found on MusTech.Net and created by Amy, Jim, Richard, and I.
Monday through Friday, each student has been charged with curating and posting both a newsworthy article and an additional item of interest on the MusTech.Net Facebook page. This item of interest could be an inspirational quote, about a useful piece of technology, a link to an interesting website, or anything else that they find both interesting and related to the topics of Music, Education, or Technology. After each week, the information posted on our Facebookpage will be correlated and become part of another initiative started on MusTech.Net several years ago -the Monday Morning Music Mix. Each Monday, the “Mix” will be posted and recap all of the previous week’s posts by the college students and include a number of other pertinent news-related items. The initiative will continue until May 2013. The “piloting” workforce behind this initiative includes five Grove City College Music Major Undergraduates -each one of them bringing a different background and perspective to the project. Depending upon how the initiative evolves, other undergraduates from different colleges and universities may be considered to participate in this project at a future date. Each student has been tasked with a specific day to post their information and to keep it as “fresh” and current as possible. While the main details of the initiative have been decided upon, there will likely be a number of “tweaks” to it over the next month as it becomes realized. With regard to the how the students are finding “what to post about”, I’ve instructed them that “what to post about” is a large part of the benefit and educational process of the initiative for them… How does one know what is interesting or useful? How does one even find something “new”?, etc. To those specific ends, we’ve discussed better ways and approaches to search and find specific and current topics on the various related websites. I’ve also asked them to become much more involved with the “pulse” of the music related discussions that are happening through established organizations and via social medial networks and to pay attention to the content of the conversations that are transpiring on them as they will likely lead to postable ideas and resources. I’ve also encouraged them to trust themselves if they think that they’ve found something interesting as it is likely that others will find it interesting too; it’s not even necessary that they like or agree with what they find, but rather is it newsworthy and of interest? I have high hopes for this project, not only for the undergraduates that are part of it, but also for the potential hundreds and thousands that will be reached and impacted by the content and useful information that the students provide through the initiative. 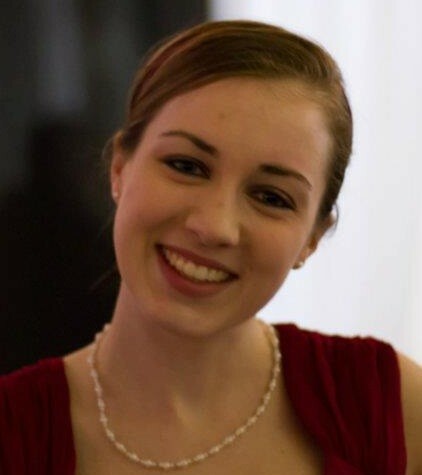 Rebecca Redmond is currently a Senior Music Education Major at Grove City College with a concentration in the clarinet and the lead student of this initiative. An accomplished clarinetist in addition to her music education studies, Rebecca has performed with the Pennsylvania Intercollegiate Band as well as won the 2012 Grove City College Concerto Competition allowing her to perform as a soloist with the Grove City College Symphonic Orchestra. Rebecca is very active in the ensembles of Grove City College, participating in the Wind Ensemble and Concert Band where she is the principal clarinetist, the Chapel Choir, Symphonic Orchestra, GCC Singers, Revelation Ringers Handbell Choir, and pit orchestras. Rebecca has also served as the student conductor for the stage band, the student leader for the college’s woodwind quintet and is currently the Drum Major for the Grove City College Wolverine Marching Band. Aside from her performance activities, Rebecca is a collegiate member of NAfME and is an active member of Grove City College’s chapter of PCMEA, serving as the fundraising chair and previously as the vice president. Rebecca also works as the assistant band director at Mercer High School, aiding in the high school music programs extracurricular ensembles. Rebecca will be student teaching in the Spring and is very excited for this opportunity to connect with so many music educators! Sarah Boice is currently a Junior at Grove City College double majoring in English Secondary Education and Music with a concentration in Voice. On campus, Sarah is involved with many ensembles including Touring Choir, Chamber Singers (the select group from the Touring Choir), and Orchestra in which she plays the French Horn. In the past, she has participated in Chapel Choir, a student led group called Covenant Choir, Wind Ensemble (also on French Horn), Trombone Choir, and Stage Band in which she played both Tenor and Bass trombone. She also serves as the director of the Revelation Ringers handbell choir, the Student Music Director for the 2012 fall musical production of The Apple Tree, and substitute horn player for the brass quintet called Gallery Brass. Off campus, Sarah performs regularly. She sometimes substitutes for area organists and often appears as a guest soloist for worship services at multiple churches playing organ, French Horn, or recorders, and singing. She has also been a member of the All-star College Pops Chorus for the past two years which has allowed her to work with Marvin Hamlisch, Robert Page of Carnegie Mellon University, and the Pittsburgh Symphony Orchestra. 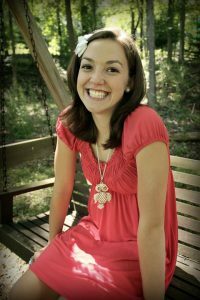 After graduating from Grove City in 2014, Sarah plans to teach either or both English and Music at the secondary level and to earn a master’s degree in Education. 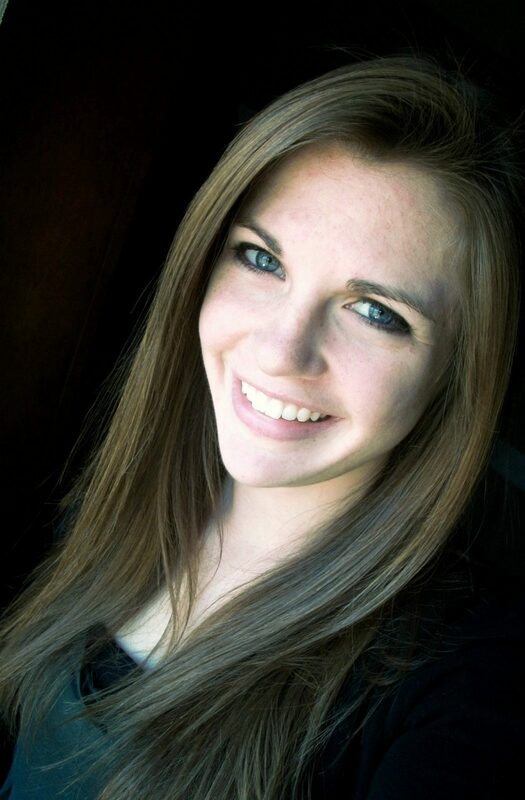 Holly Boyce is a current Sophomore music major at Grove City College, concentrating in voice. At the college, Holly has been involved in the chapel choir, marching band, stageband and the touring choir in addition to keeping up with her studies. She is also involved in Signature, a women’s fine arts service group, providing service and ushering at recitals and larger events. During the summers, Holly helps lead the worship at her church, and is a soloist both in voice and on her harp frequently during the year. Holly hopes to spread her passion and desire for music to people all around her, in every capacity of life. Hannah Hess is a sophomore music education major at Grove City College with a concentration in voice. 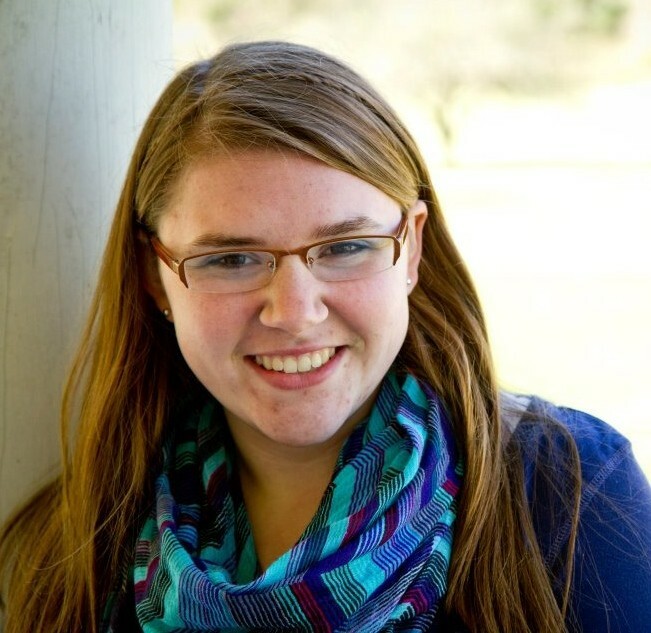 Hannah is a collegiate member of NAfME and PCMEA in addition to her studies in music education. Hannah currently is involved with both vocal and instrumental ensembles on the Grove City Campus. These ensembles include the Grove City College Marching Band, Wind Ensemble and Orchestra, in which she plays tuba. Vocally, Hannah participates in the Grove City College Touring Choir and is the student music director for Koinonia Gospel Team, a student led singing group on campus. In the future, Miss Hess seeks to become a choral director or classroom music teacher. Lauren Schmitt is currently a Sophomore Music Education major at Grove City College with a concentration on flute. She has taught private lessons for a couple of years as well as played in several ensembles throughout her life. Along with her academic studies, Lauren participates in many of the ensemble groups at Grove City College including Wind Ensemble, Concert Band, Marching Band, Chapel Choir, Symphonic Orchestra, woodwind quintet, flute choir, and pit orchestra. As of this year, Lauren serves as one of the student directors for the flute choir. 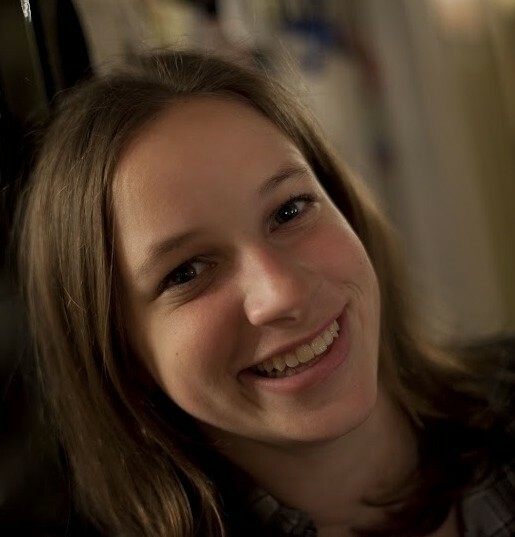 Lauren is looking forward to the opportunity to connect with music educators as well as share her interests with so many people!